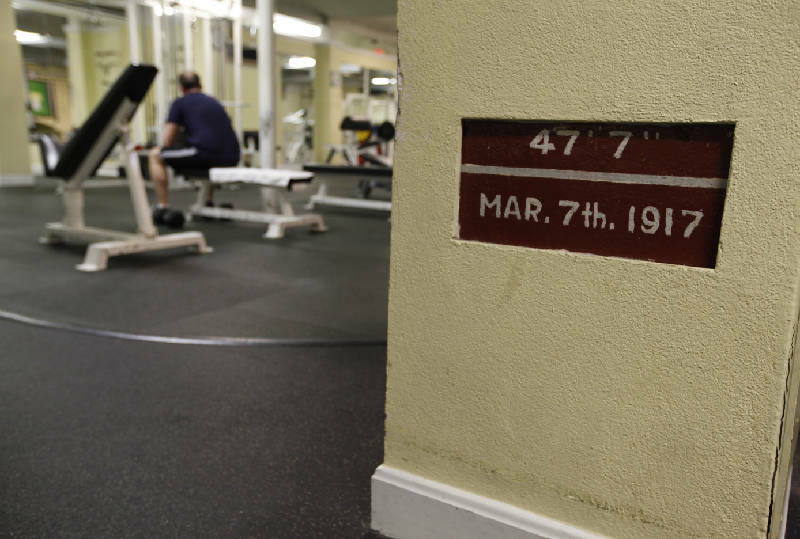 A marker in the basement of the Sports Barn on Market Street denotes the high-water mark of a 1917 flood in Chattanooga, 47.7 feet. As devastating floods chronically ravaged young Chattanooga, residents and business owners took it upon themselves to keep their city on dry land. March 7-11, 1867 -- Rain falls for four days, ushering in the largest flood in city history. The Tennessee River crests at nearly 50 feet -- 28 feet above flood stage -- inundating downtown. "This calamity should rather be an incentive to new efforts," a newspaper article states, saying that city leaders plan to have "the grade of every street in Chattanooga ... raised to a sufficient height above the level of this flood to preclude the possibility of any part of the city ever being again submerged." March 1875 -- The river reaches over 20 feet above flood stage, with a crest higher than 42 feet. After this flood, city leaders agree something more drastic has to be done, and they begin weighing the idea of building a levee or raising the grade of the soil. April 1886 -- More than 4,000 suddenly homeless residents are taken by boats to higher ground at Lookout Mountain and Missionary Ridge as the river crests at over 20 feet above flood stage. April 10, 1886 -- An editorial in the Chattanooga Daily Times bemoans the haphazard process of raising the city's street level. "We have hitched up a corner here, a block there and part of a block yonder, each bringing a lawsuit for damage ... confusing builders so they cannot tell what height to put their first floors." March 1917 -- The river crests at about 18 feet above flood stage. Many homes and businesses are flooded, with water skimming rooflines along Rossville Boulevard. 1920s -- The U.S. Army Corps of Engineers surveys several sites for a possible dam to protect the city from floodwaters. May 1933 -- President Franklin D. Roosevelt establishes the Tennessee Valley Authority, which begins to harness the river through the construction of dams over the next decade. These are just a few of the downtown buildings that have basements or access to underground chambers that were once ground floors. All of these building are privately owned, with no outside access to the public. The Bijou, now the Chattanooga Visitors Center, 215 Broad St.
Big River Grille & Brewing Works/Bluewater Grill, 222 and 224 Broad St. The James Building, 721 Broad St. The Read House, now the Sheraton Read House, 827 Broad St. The Sports Barn, 301 Market St. The Miller Brothers building, now BlueCross BlueShield, 629 Market St. The Loveman Building, 800 Market St.
Fischer Evans Jewelers, 801 Market St. There are two Chattanoogas. The one we see, and the one we don't. The city we see bustles with restaurants, shops and gyms housed in buildings old and new, mixed like puzzle pieces between downtown city streets. What we don't see lies beneath the streets, a crazy quilt of yesteryear's commerce buried a century ago, but preserved in traces found in basements and passages that once were the city's ground floor. We don't see the town that Chattanooga buried to save the one we have today. Like all of the city's history, the story of Underground Chattanooga starts with the Tennessee River. After a series of devastating floods in the late 1800s and early 20th century, the town that began as a river trading post at Ross's Landing reinvented itself. Stunned by the waters reaching 30 feet above the river's normal banks in 1867, the townspeople quietly and steadily began to raise their street level by 3 to 15 feet. A piece at a time, Chattanooga filled in about four city streets - Market and Broad, and portions of Cherry and Chestnut - from the river to Ninth Street, what is now M.L. King Boulevard. In time, about a 40-block area of the city rose by about a story. Some second floors became first floors, and first floors became basements. Towering window arches became foundation decor or basement light vents. Yet this massive feat - the raising of a town - has gone largely ignored in city history. "There's very little documentation of it. And it really wasn't even in the consciousness of Chattanooga for years," said Chattanooga archaeologist Nick Honerkamp, UC Foundation professor at the University of Tennessee at Chattanooga. But the existence of Underground Chattanooga increasingly is becoming more than just a historical curiosity. In January, a second massive water line break in less than a year gushed for hours before workers could locate long-buried and paved-over valves, prompting questions about the old infrastructure winding between today's Chattanooga and that of a century ago. Each summer the city copes with chronic problems of sewage stench from 100-year-old combined sewer and stormwater runoff chambers that can't be completely tracked. And every new downtown building project has to deal with concerns of the shifting, polluting foundry sand fill material crews originally used to make the city higher. In the city's first century, many businesses gave up a story to escape river flooding. What they left behind is a maze of disconnected basement real estate and acres of potential for trouble. Only a handful of news clippings and city records hint at the massive undertaking. But throughout downtown there are little clues. Shin-high windows and mysterious 12-foot-high rock foundations standing as out-of-place monuments beneath sidewalk grates. Basements with doors and windows leading nowhere. At the Sports Barn, many Chattanoogans do their abdominal crunches beneath concrete arches now only four feet off the floor. "If you go to the basement of the Sports Barn downtown where the track is, you're in underground Chattanooga. And where they brew the beer at Big River is underground Chattanooga. If you've gone in the tunnel under Market Street between the old Miller Brothers Department Store and the furniture store, you were in underground Chattanooga," said Maury Nicely, a Chattanooga attorney and history buff who also is president of the Chattanooga History Center's board of directors. "There's not much to it, anymore," he said. "This project was about filling in for flood protection. They didn't want there to be a vast network of underground buildings." Cities have built atop themselves for centuries. American Indians lived here long before settlers and carpetbaggers named it Ross's Landing and Chattanooga. But raising the level of geography in the most recent generations had one specific purpose: save the newest and thriving town from the wild and undammed Tennessee River decades before Franklin Delano Roosevelt's Depression-era stimulus plan created the Tennessee Valley Authority to harness the river for flood control and electricity generation. By the time the floods came, Chattanooga boasted about 25,000 inhabitants, according to an 1885 fire insurance map. The booming town had at least 20 factories, 10 hotels, two schools and a pump house to supply water through 15 miles of wooden pipe. Between 1875 and 1938, the Tennessee River would exceed Chattanooga's 30-foot flood stage more than 70 times. The most devastating floods were in 1867, 1875, 1886 and 1917. On March 11, 1867 - just two years after the end of the Civil War - the river rose to nearly 60 feet. People were rescued from second-story windows as far into town as the Read House. "Reports are afloat that whole families drowned .... Nearly 400 poor creatures - men women and children - are tonight houseless, homeless and starving," states a March 1867 story in the newspaper of the day, the Daily America Union. Independently, some property owners began their own flood control efforts to build up their property. But in 1875, a second major flood with a crest higher than 42 feet galvanized city leaders to agree something had to be done. Three options were discussed: Build a levy, build a dam or raise the town. Taking dirt from higher ground and raising low parts of town seemed most feasible. "No one knows quite how they did this [as a full-scale project]," Honerkamp said. Some dirt was scraped from the hills and streets of the Bluff View area. Scant records and modern-day borings show that coal resin, sawmill scraps and foundry waste also were used as fill. Honerkamp's predecessor at the university, Jeff Brown, "discovered" underground Chattanooga in the 1970s and thought the city's acres of basements might have the same development potential as Atlanta's underground. But Brown died two years later, before he could get support for a full survey and archaeology report. His idea of resurrecting the ground floor of the city hadn't caught on. Unlike Underground Atlanta's buried rail yard, most of Chattanooga's entombed rooms and caverns are privately owned, and the owners have feared liability issues. In the ensuing decades most of the city's underground doorways slammed shut, and some were obliterated. "Just about every place you can experience underground Chattanooga is locked behind a door," Honerkamp said. Now with each new building or parking lot, much of the undercity disappears. Often that's for building safety and stability. Doye Cox, a longtime Chattanooga environmental engineer and consultant, recalls being called in to work on the new Majestic Theater at Third and Broad streets. In the demolition of the 1960s-built Haney Building to make way for the Majestic, workers unearthed buried exterior walls. "We found sub-grade structures that were obviously at street level at one time," Cox said. They found so much fill, he said, that geotechnical engineers were called in to drill soil borings and test the soil stability. With the findings, they could calculate whether the proposed structures could be supported there. Jim McGirl, one of those geo-technical engineers with S&ME in Chattanooga, said raising the city with foundry sand and fill dirt had more negatives than just pollutants. For builders of new buildings, that usually means excavating the often unstable fill dirt and other walls completely, then drilling to bedrock and cementing new footers directly to that bedrock. There are other infrastructure concerns. Those who best know Chattanooga's innards are the construction crews and maintenance workers - those who navigate the underworld of pipes and powerlines, sometimes unearthing the time capsules of a forgotten age in the process. "We rediscover parts of it from time to time when we have to excavate the main or make a new service downtown," said Ron Schiefer, field service supervisor for Tennessee American Water Co. "On Market and Broad Street you almost always run into something." Jerry Stewart, Chattanooga's director of Waste Resources, acknowledges significant stormwater and sewer problems downtown where some of the combined lines are more than 100 years old. "If it's in the street, it's one thing [to track and fix it]. But sometimes it'll go under a building and we don't know where it comes out," he said. Except for the sewer line, most of the city's utility lines now run above what would be considered Underground Chattanooga. The few gas and water lines that were installed in the city before the grade was raised have long been abandoned and replaced. "We really don't have a clear timeline for when everything was originally put down, when the fill material was put in, and whether they had to dig all those pipes up or they waited to install them until after," said Steve Leach, head of Chattanooga's Public Works Department. "We just don't have records of that." Downtown factories were fed by gas lines as early as the mid-1850s, and Union troops had installed a network of wooden water pipes under the downtown in 1864. The city's first large, brick sewer mains - some still in use - were installed in 1889, according to city records. "They were probably laying [the sewers] around the same time they were raising the grade," Stewart said. Over the years, technicians have regularly uncovered cavities beneath the streets during maintenance work, but none of the utility companies say they keep maps or records of where anything other than their own lines are located. "I think it matters from a historical point that it all be brought together at some point, but in day-to-day operations it doesn't have much effect on what we do," said Mark Zinnanti, production superintendent for Tennessee American Water Co.
City officials say they don't have major concerns about the structural integrity of the roads or buildings that sit above the underground caverns. "It's hard to believe how much has been filled in, but I think they've stood the test of time," Leach said. "We do monitor for cracks or depressions that would indicate a sinkhole, but we don't have a serious concern about it happening." Some familiar with the properties have more doubts. Buddy Parks, who managed the Jackson Building on Broad Street in the early 2000s, said he long has held concerns about a portion of the building's now-basement that juts out under the sidewalk of Broad Street. "When you're walking on those sidewalks, you're walking above those rooms. I do have worries about its structural integrity - the beams have some tremendous rust down there." EPB engineer II Mike Jones said crews digging trenches under Broad Street have run into several old basements interred under the road. "We've had to capture some of that space in order to create our vaults," he said. "It's not clear who exactly that space belongs to, because it's in the right of way. Usually the building owners will let us section off a portion - but you could probably get into some hairy legal issues there." Cox, an environmental consultant and senior project manager with Barge, Waggoner, Sumner and Cannon, recalls being called in to remove the car hydraulic jacks that had been mounted in the basement of the dealership on Market Street near where the Sports Barn now sits. As workers pulled the hydraulic jacks out, a hole opened up to reveal a cave with water running in it. "We stuck a 20-foot piece of rebar down there and couldn't touch the bottom or the sides, so we called in a structural engineer and he told us what to do and we sealed it back up. It was there 50 years before we touched it and it's been there 20 or 30 years since, so we must have done a good job." Cox also said workers found bones in one pit there. "I thought we'd found an Indian graveyard or something, and I had to call in an archaeologist. I thought it would stop the project," he said. "What it turned out to be was mule and horse bones. The city stable used to be next door, and whenever an animal would die, they'd throw it down in the sinkhole." Today, some leftover pockets of the city's ground floor take the form of abandoned chambers with dripping ceilings and cobwebbed entrances, while others are now camouflaged as run-of-the-mill basements brimming with storage. The passage beneath Big River Grill and the Sports Barn is cavernous and damp, strewn with concrete rubble, shattered glass and rusted pipes. Metal stairs lead to sealed ceilings, and a doorway halfway up one wall leads to the lockers and sinks of an abandoned men's lavatory. Underneath the cheery interior of Scenic City MiniGolf on Cherry Street is a dark maze of bricked-in rooms and old rock walls wrapped in spider webs. Rotting doors give way to narrow passages that squeeze between brick store fronts and suitcase-sized stones stacked to reach the street above. Strewn liquor bottles and charred pits in the dirt floors show some evidence that the now-sealed underground area was once accessible to people off the street, looking for a place to camp. "It took me forever to actually come down here after we leased the building," said co-owner Sharon Van Cleave. "It is just incredibly creepy." Some basements - like those in the Jackson and Loveman buildings - are more finished, but their blocked-in archways, old uneven stone walls and unusual floor plans hint at a sunnier, more foot-trafficked past. Though many property owners and managers have passed down stories about their strange underground spaces, very few have records of what the buildings looked like before and after the fill. At this point, no comprehensive record of the city's structural evolution exists. The public library has microfilm records of historical insurance maps, but no one has tried to compile and compare them with today's property. And local utility companies have few records outlining the kind of adjustments made to the city's infrastructure during the fill-in process. "That's a sad part of history, that we don't have good records of this," said Larry Buie, regional director for the Chattanooga Gas Co. "I know that during and after the filling period, work crews had to gradually raise the gas lines closer to the surface." The water lines have been raised and replaced, too, though some mains still run beneath old streetcar lines - complicating repairs such as the one at the main break on Georgia Avenue in February. In that case, the city had long paved over the valves needed to stop the water flow. While struggling to reach the main, crews uncovered cobblestones that were part of an old road bed. What maps utilities have of their own infrastructure, they don't readily share, except to Tennessee One Call - which must permit all digging and map out where other utility lines are buried. But even those studies don't include the possible complications from the remains of Chattanooga's bottom floor. When work crews unearth a section of hollow ground or a plumber heads into the dark bowels of an old downtown building to find the source of a mysterious leak, there's no way to know what they'll find. "When it's just you deep down in some of these places with no lights, it can get really creepy," says plumber Curtis Duncan with Chattanooga Plumbing Co., who has worked in several pockets of Underground Chattanooga. "All you can see is what you're flashlight is showing you, and you can get a really eerie feeling," he said. "There's just no telling what's down there."